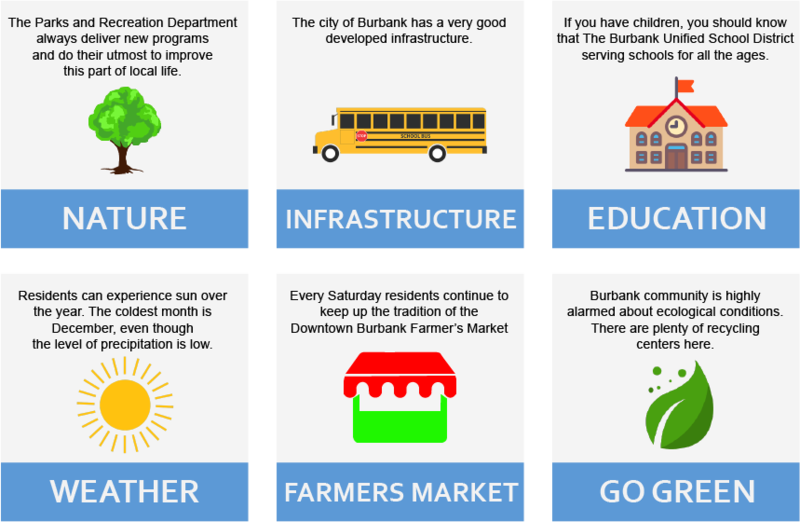 If you are thinking about moving to Burbank there is a reason to learn about local life and benefits you can get living here. Burbank located in the Los Angeles metropolitan area, practically next to Hollywood. This place happened to be a home to a number of media companies well-known around the world. That is why many people refer to Burbank as a “Media capital of the globe”. But Burbank is much more than its reputation. City’s motto sounds next way: A city built by People, Pride and Progress. According to moving statistics, over 20% of residents have been moved here in recent years. Today city has a population of 105, 340 residents. The level of unemployment is 5 %. Is it worth moving to Burbank? You might wonder what exactly Burbank has to offer you. Here are some advantages of moving to this city. For starters, the weather – residents can experience sun over the year. The coldest month is December, even though the level of precipitation is low. Such climate conditions allow experiencing outdoor activities during the whole year. Every Saturday residents continue to keep up the tradition of the Downtown Burbank Farmer’s Market. It is the place where you can both recreate and buy some delicious food. Speaking of recreation, we must say that Burbank has 41 public parks for different kinds of activities. The Parks and Recreation Department always deliver new programs and do their utmost to improve this part of local life. It is hard to ignore the fact that Burbank is a place with beautiful scenery. The northern border of the city faces amazing Verdugo Mountains. The whole place in general blooms with nice South Californian plant and trees. The city of Burbank has a very good developed infrastructure. It includes basically ideal connection by highways and railroads, public places, the city’s government and public safety departments. Burbank has its own police and fire departments. Both are separated from Los Angeles departments, which enrich the feeling of safety among residents. The hospital Providence St. Joseph Medical Center is another facility of significant matter in the city. Burbank community is highly alarmed about ecological conditions. There are plenty of recycling centers here. It’s important to note that the government encourages people to follow the ecological decisions in public and private life. If you have children, you should know that The Burbank Unified School District serving schools for all the ages. There are plenty of elementary, middle and high schools. The campus of Woodbury University is another facility for graduate and ungraduated programs. Despite all the advantages of moving to Burbank, like any other place, Burbank has some weaknesses. It is definitely not suitable for everyone – prices can be very high. Let’s take a look at real estate here. The median home price in Burbank is near $817,000 in 2019. 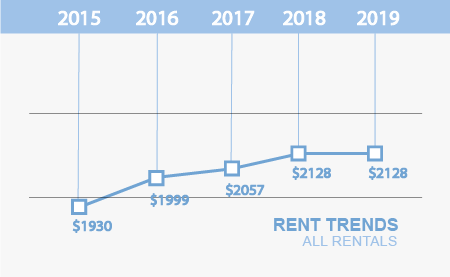 The median rent price for 1 bedroom apartment is $1,924 (667 sq. ft.). 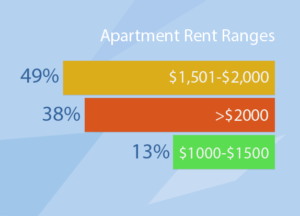 Only 13% of all apartments have prices less than $1,500 a month. These prices affect the cost of living in Burbank in general. Proximity to Los Angeles is a partly reason for that. Burbank is situated in the seismically active zone. As well as the most part of California, the place is open for natural disasters by its geographical position. Also, some people seriously think that the loudness of nearby Hollywood areas can be a problem. Burbank is one of these places where you will never feel a lack of entertainment. There is always something to do and to see. First of all, your kids will find fascinating the fact that so many big animation studios have theme parks here. Take them to The Warner Brother’s or Walt Disney studio – and you won’t regret it. If your kids are teenagers, they probably will be pleased to know that Burbank is home to numerous skate parks. There are annual festivals to attend. In July residents as well as visitors gather to visit Burbank Classic car show. The best car companies of all kinds will be showing the examples of classic cars. In September Burbank is open for those who can’t imagine their life without good movies. As you guessed, we are talking about the Burbank International Film Festival.If you are into music visit amazing The Burbank Philharmonic Orchestra. The concerts and events here are very often performed for free. So you are just welcome to come and enjoy live music show. What is really unique about Burbank and exists in only one example is the Martial Arts Museum. You wouldn’t find another institution like this somewhere else. The residents of Burbank are very fond of horse riding. People usually come to The Rancho Sierra Vista Equestrian Center to practice this kind of sports. Dining options are well-presented in Burbank. You can enjoy national food from different countries, there are great bars and restaurants all over the place. The Bob Hope Airport serves about 60 flights per day. Millions of travelers use this airport every year. For those who prefer cars, there are two major routes – the Golden State Freeway and the Ventura Freeway. If you are travelling with a light bag behind your back, consider rail connection. The services ensured by local Transportation agency work flawlessly. It includes Metrolink, which is serving over 50 rail stations in the region, and Amtrak station. Do not forget about California High-Speed Rail, which is also connected to Burbank. Burbank bus is a convenient way to move through the city. The bus system has scheduled routes to every part of the place and neighborhoods. If you want to move to Burbank, there is a reason to call a moving company. If you want to make it quick and stress-free, you can always rely on our professional movers from California moving company. We have a perfect understanding of the whole moving process and know how to make it successful. Let’s take a look on best Burbank neighborhoods. It’s important to say that neighborhoods considering as a 90% more expansive in this part of Los Angeles metropolitan area than in the United States generally. Scott Rd / Heaven Way – one of the best neighborhoods for married couples in California. The crime rate is very low, there are plenty of public schools and educational facilities for children. In addition to that Scott Rd has 15% higher income than generally in America. Culturally diverse, this neighborhood is home for Armenian ancestry and Iranian ancestry. Kenneth Rd/Jolley Rd – the average rental price in N Kenneth Rd / Jolley Dr is $4,400. Neighborhoods also very suitable for families. High income among residents makes the neighborhood relatively wealthy. Almost 90% of residents drive in private cars. In such neighborhoods very common to use a car instead of public transport. N Kenneth Rd / E Magnolia Blvd – a little bit chipper but still very expensive neighborhood. Very popular among college students and people of middle age. This fact explains why the statistics of income quite different here – it is upper-middle. The level of safety is very high. No wonder that you need to spend some amount of money for your move. Moreover, to make it truly successful and safe, you must estimate the cost of moving to find the best option among moving companies from Burbank. It is always better to pick up a few services which you really need for your type of relocation. It will save you from extra expenses. If you doubt some methods practicing by moving companies you have heard about, just consider next fact – to keep all of your possessions in safe during the relocation to Burbank can be a hardship. Especially without professional equipment. When it comes to moving furniture to another state or city, professional movers can perform secure packing and wrapping – to prevent any possible damages. Full-service moving companies offer different services separately or together. It is completely up to the customer what to choose. The professional moving crew can perform packing, loading, transportation your goods. So, first of all, find a trustworthy moving company. It will guarantee you strict schedule, professional attitude and secure transportation of your belongings. Before moving in make sure that you won’t have a problem with a driver license or resident’s card. You have 20 days to register your car after becoming a part of a community. You also must have insurance to complete this registration. Make sure that you will have time to acquire driver’s license in 10 days after becoming a resident. If you have a pet learn how to get a new dog license. In the case you are having a business and moving to another office, especially from another state, close it in your precious state and open in California. Once you take care of these little things in advance, it will make your move easier emotionally. Let a professional moving company provide you with safe and quick transportation.